The boffinry nerve center of the US military is working with seven American universities to see if electrically stimulating the brain will increase the ability to learn new skills. The Targeted Neuroplasticity Training (TNT) program is focused on synaptic plasticity, the ability of the brain to build new neural pathways to absorb knowledge. By stimulating the nerves that connect neurons in the brain and spinal cord to organs, skin and muscles, the Defense Advanced Research Projects Agency (DARPA) is hoping that the brain can be trained to learn new skills more quickly. "The mechanisms underlying this enhancement are not well understood," said TNT program manager Dr Doug Weber on Thursday. "But we believe that neurostimulation boosts the release of neurotransmitters such as acetylcholine, norepinephrine and others that play a role in modulating cognitive processes related to learning." 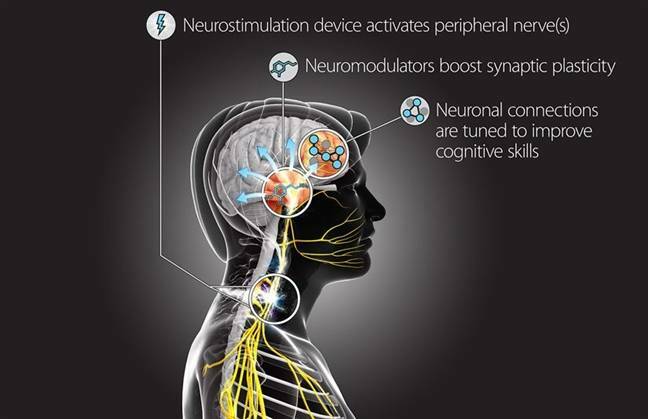 To achieve this, DARPA is going to try both non-invasive electrical stimulation and implanted devices that use electrical stimulation of peripheral nerves through the skin, and then see which one works better. The goal is to develop a device that works on skin nerves to get the brain into overdrive. The first stage is to map out the neural pathways in the brain used for specific tasks. An Arizona State University team will work with Air Force personnel to study how the brain reacts during reconnaissance, sharpshooting, and surveillance. Weber said that there was almost certainly no "silver bullet" to the issue, "but rather there are multiple processes involved. Thus, a primary goal of TNT is to tease apart the various mechanisms to understand the links between neurostimulation, neurotransmitter release, and resulting changes in plasticity." The initial study into invasive and non-invasive brain stimulation devices will be carried out at Johns Hopkins University, as well as a mapping process on the brain to understand how we learn foreign languages. The goal is to turn the average squaddy into a cunning linguist far more quickly than is possible today. Weber said that the research would be ethical and scientific. He noted that there are already so-called brain training devices on the market, but they are unproven. "You can go online right now and for $50 buy a device that claims to stimulate your brain to do all sorts of things," he said.